The Palouse is a region encompassing parts of southeastern Washington and north central Idaho. It is a major agricultural area, primarily producing wheat and legumes. The Palouse region was originally defined as the fertile hills and prairies and underwent a settlement and wheat-growing boom during the 1880s. The Palouse was once an extensive prairie composed of perennial grasses. Today virtually all of the Palouse Prairie is planted in agricultural crops. Considered one of the jewels of the Northwest, the Palouse’s beauty is considered to be on par with the idyllic Tuscany. Numerous rolling hills, small towns and barns dot the landscape. During the spring the landscape is green wheat and flowers. In the summer there will be a wide palette of warm tones and colors especially in the morning and afternoon light. Some will visit during the winter to photograph the frozen ridge lines and snow covered farms. 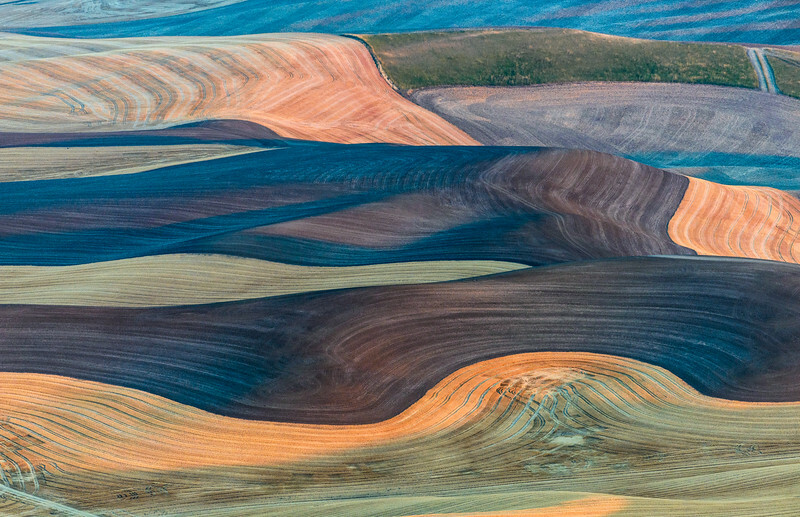 The Palouse is also considered one of the top photography landscape destinations in the world. Come see it this August as we will be photographing the rolling hills that are blanketed with a patchwork of colors and design. As almost on purpose the giant farm machinery leaves behind graphic patterns that are a delight to photograph. The light and shadows that criss cross the hills excite ones senses creating endless possibilities to practice your abstract landscape skills. Some of the places we will photograph on our road trip will include: Iconic views from Steptoe Butte at 3600 feet. 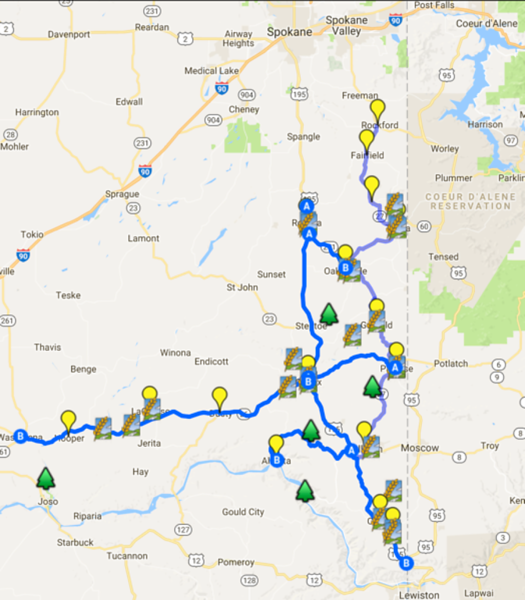 Numerous barns, silos, windmills, tractors, and scenic farms Small towns including Dusty, Colfax, Colton,, Garfield, Rosalia, Palouse, LaCrosse and more along the Palouse Scenic Byway. We will strive to help you improve your technique and your photographic vision by studying color, composition, and light. We will also discuss Black & White digital techniques and panoramas. Our workshop will be organized for all to leave the Palouse with great pictures and with a new found knowledge. It will be a memorable and fun experience for all. Open to photographers with all levels of experience. Your instructor, Keith Skelton, has over 30 years of experience as a educator and as a professional photographer. Keith is a graduate of Brooks Institute of Photography. THURSDAY - August 22, 2019 We will meet you in the late afternoon at in Pullman WA. On this first day we will start with an orientation and introduce each other. Afterwards, we will head out for our first evening shoot. Sunrise at 5:50AM and sunset at 7:50PM. We will have dark skies on August 24th for possible night photography. FRIDAY This will be a full day. We will begin by rising before dawn to photograph the sunrise. After breakfast we will begin to explore different areas along the Palouse scenic route. SATURDAY Once again, we will begin early in the morning continuing to explore and photograph the various farms and small towns. SUNDAY This last day we will rise to photograph from Steptoe Butte again. This is a favorite place for many photographers. By about 10 am the workshops will conclude. The rates are about $135 per night for two bed Queen non smoking rooms. Price of the workshop DOES NOT include lodging, meals, and transportation. However, we will try to car pool to various locations while shooting. There is a tuition discount for previous workshops participants. This class in limited to 10 people. You will receive an email with the exact meeting place and time approximately 2 weeks before the workshop. The Palouse region is located in Eastern Washington State. Pullman WA is home to Washington State University. Arriving by Air - Most participants fly into Spokane International Airport (GEG), rent a car and drive about 1.5 hour south to Pullman. You might also fly into Pullman, WA (PUW) which might be more convenient.